Whatever the outcome, Challenge Cup history was being made this afternoon in the Cumbrian countryside as Millom RLFC, the oldest amateur side in the country laid out the welcome carpet for Red Star Belgrade who were making their debut in the competition. National Converence Division Three side Millom were handed the draw of the round, in terms of interest, when they were drawn out to host a Belgrade side packed full of local Serbian players in the round one pairings. There had been intense media attention and a decent crowd had gathered in one of the great rugby league heartlands ahead of the game. Belgrade kicked off playing into a strong wind, which advantaged Millom who opened the scoring after five minutes with Noah Robinson crashing over the line from close to ground under the sticks. The conversion was added by Adam Kelly for a 6-0 lead. Dominic O’Brien added the second try of the afternoon on fourteen, again from short range, the big second-rower breaking the line and diving over. Millom were unable to add the conversion, the home side 10-0 ahead. Darcy Etrich made history with Red Star’s first Challenge Cup try as he dropped the shoulder on the Millom twenty and went through a broken defensive line to score by the right upright. Milos Sobovic added the conversion for 10-6, Belgrade back in the game with twenty-four minutes on the clock. Millom struck back immediately when Tyler Lancaster crossed by the left corner flag for the third try. The conversion was missed from wide, Millom ahead by 14-6. Chris Warren bulldozed his way over the line on thirty-five, bursting between two defenders and over the top of the last tackler to ground in the right corner. The kick again failed to hit the target, but with seconds left Kelly kicked a wind assisted forty metre penalty goal, and when the following Belgrade kick off didn’t make the required distance, a second from the half-way line. Millom went into the sheds with an 22-6 lead. 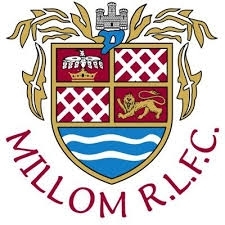 Relentless second half pressure from Millom saw them extend their lead when Jonny Hodgson collected his own deflected grubber kick to ground over the line. Kelly added the conversion for 28-6 and the Cumbrians were edging their way into the second round. Twenty-five minutes remained. On seventy, Aleksander Borgevik managed to find a chink in the Millom defence to duck under the defensive line and ground. Sobovic was unable to add the conversion but the visitiors were into double figures, trailing 10-28. Dominic O’Brien scored his second on seventy-six, as the Belgrade defence tired, when he ran the angle to ground fifteen in from the left touchline. Kelly saw the wind push his ball wide of the left post but Millom had a comfortable 32-10 lead. A great Adam Kelly offload saw brother Ethan Kelly over from five metres to seal a Man-of-the-Match performance.His brother Adam added the conversion for a final score of 38-10. It was a gritty performance from the Serbains but Millom were never in any danger of cup elimination. It was no walkoverand something for Belgrade to build on but a few errors cost them dear with Millom not willing to make any allowances and punishing them harshly. Millom in the hat for the next round while Belgrade will look to be back next season. Millom RLFC: Brooks, Harris, Lancaster (T), Dawson, Dixon, Hodgson (T), Kelly A (4G), Kelly E (T), Robinson (T), Kelly D, Wright, O’Brien (2T), Sibley. Subs: Donaghue, Warren (T), Elmslie, Carter. Red Star Belgrade: Sobovic (G), Krstic, Bordjevic (T), Anderson, Trifunovic, Etrich (T), Nikolic, Manak, Dedic, Janovik, Keglic, Robinson, Nedelkovic. Subs: Djuric, Cengas, Badic, Milanovic.